We are taking part in a blogging challenge and today is a challenge for sure. I have been home sick today and working on the books while home so not really thinking about inspiring crafty things to write about. I am lucky that I have great people working at the shop so I can stay away when sick. A few of them have even worked while sick lately which may be why I am sick and even why some of them got sick. This is a problem we small business owners face and there is not much way around. I wish that it was easier to tell everyone to just stay home if you are sick, but then we would have a hard time opening the shop some days which in turn would lose us sales and in turn would make it hard to stay open. Thank you to all who work so hard and I apologize for not being able to say “just stay home”! Thank you for letting me stay home! It is December and time to be trying to reconcile everything in the Quickbooks so that we can get our taxes done quickly in the new year. I have to get this done very early every year because I still have a child in college and we need to fill out the FAFSA finacial aid application each year which needs to be done well before the tax deadlines for businesses and personal taxes. This puts pressure on to get things done as early in January as possible. So…I really should be spending more time at home over the next several weeks to get all this book work reconciled and ready for the accountant. So…the blog today is more about the not so exciting but essential things going on behind the scenes of my little quilt shop. If you read this post, thank you! I’ll work on more exciting things to come! 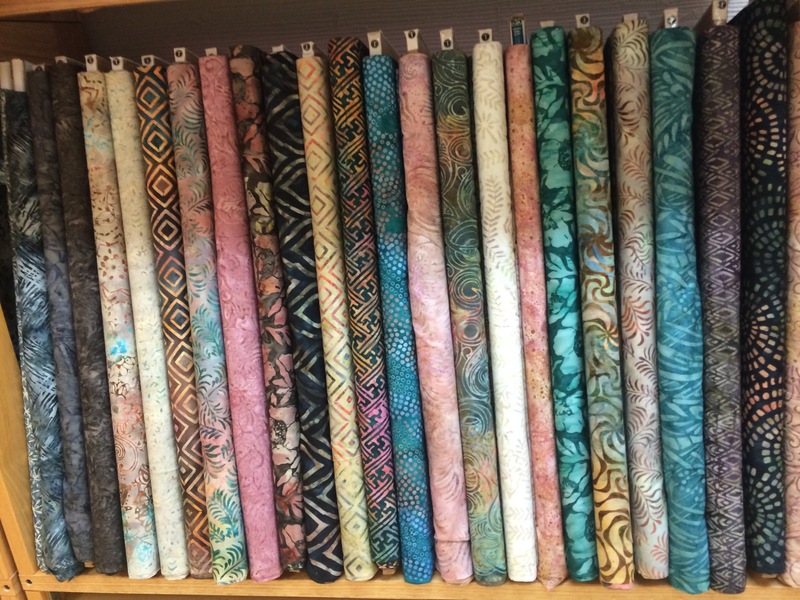 Well, we don’t usually focus solely on batiks but……we got some pretty, new ones in and out on the floor yesterday so here they are! In order to fit these new batiks, we had to purge some others and being that it is the end of the year and we have to pay a tax on all inventory we still own on 12/31, we decided to purge way more than we needed to. Ready to see that picture? Yes, this is a lot of fabric that will be going into the sale bin on Saturday! Don’t miss out being first in line on some pretty batiks at below retail prices and seeing the newest batiks at IQ in person this weekend! 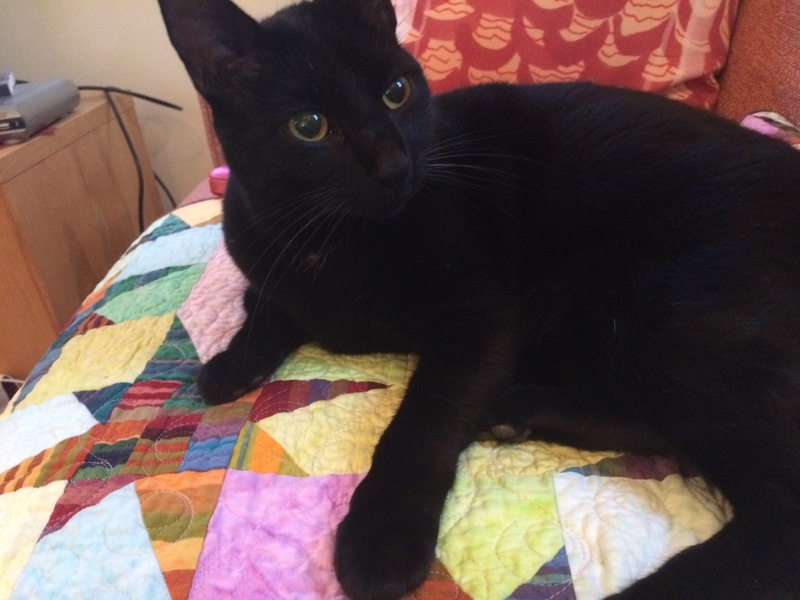 If your reading this blog, you must have some quilts. Do you keep them folded up and stored somewhere? Do you use them? 1. To protect the current favorite pet sleep spot on the furniture especially on rainy days when the cat comes in damp. 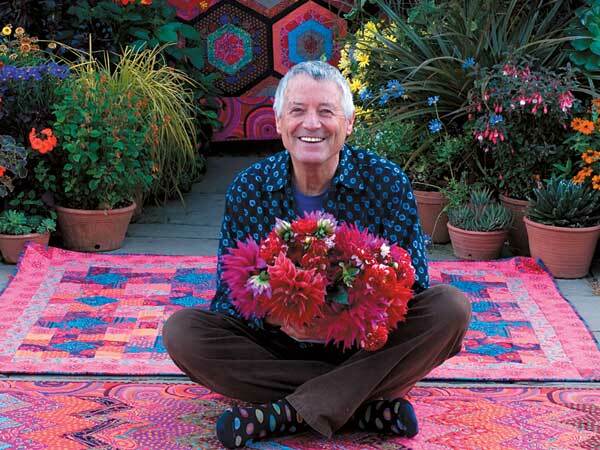 This is a great use of small wall-hanging size quilts. There are regularly small quilts on the couch and rocking chair in Sarah’s house as seen in the picture below. 2. To protect the car seat when taking the dog in the car. 3. Draping a folded quilt on the back of a chair the back of a hard-backed chair is a great way to enjoy the beauty of a quilt while also making the chair more comfortable to sit in and keeping a quilt close by for cuddling in the cold. What are some of your alternate uses for your quilts? We have not been very good about blogging and are working on getting better at it so we are jumping into a 31 day blogging challenge put on by Muppin on the 2nd day of the challenge. We will see how it goes. We have been busy at the shop counting all the fabric we have for our yearly inventory and to update it all in our new POS system. What is a POS system? It is a Point of Sale system (a computerized cash register) that sometimes we all might like to refer to as the pos POS system. While they can keep track of things much better for us, so we can better fill orders online and in the store, they do take a lot of work and bring about a lot of headaches. We are happy to have it though. We just really hope that the company can work out more of the kinks so it runs smoother while we work hard to make sure everything is in the system. I will say we have really enjoyed counting all the fabric. We get to put our hands on it, fondle it and see what we have been missing. 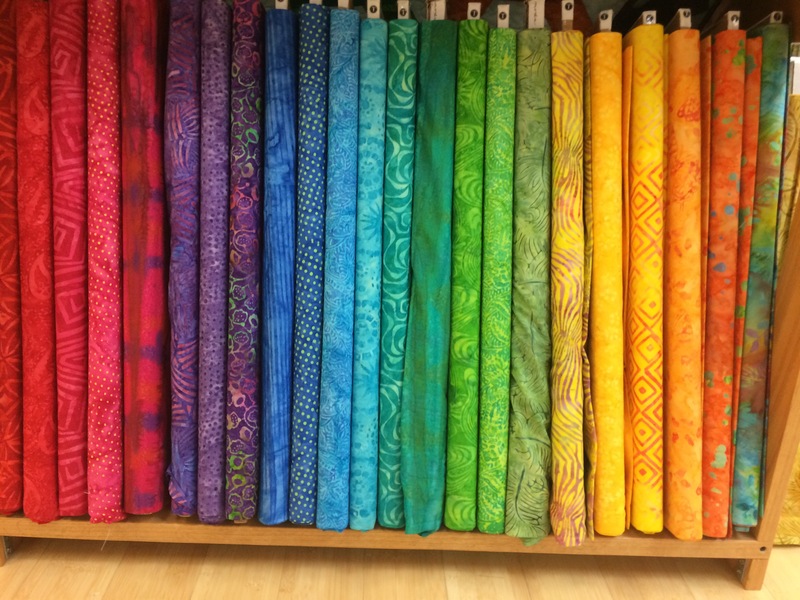 We have some really pretty fabric! I got to count batiks yesterday and today and man are they pretty. I love this one. 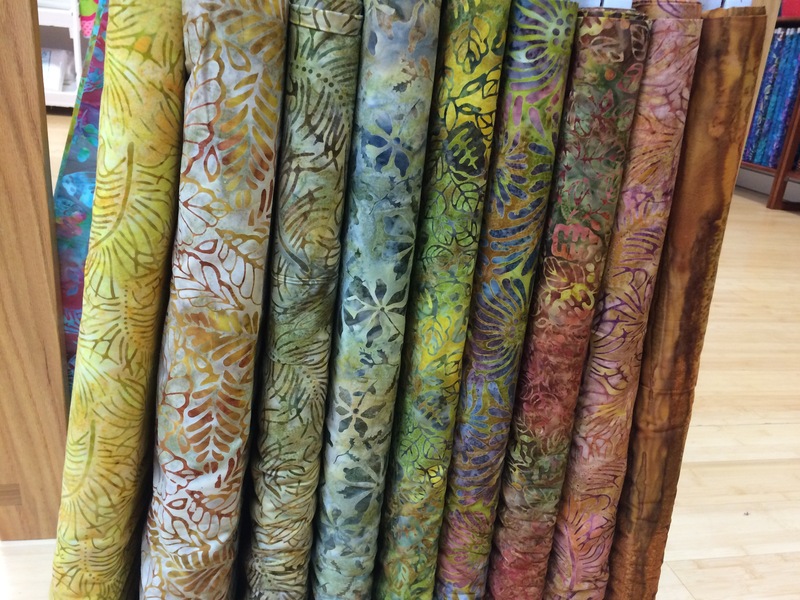 You can check out some of our great batiks here. Check back tomorrow for post no. 2. Ellen Baker of The Long Thread and Sarah Phillips of Intown Quilters are working on an #Instaquilt digital quilt project at the Maker tent at the Decatur Book Festival on Sunday 8/31 at 3pm to join in. Ellen Baker and Sarah Phillips decided to expand on the idea of image sharing to create a collaborative digital project where everyone will create their own quilt block, photograph it, and share the image through social media. Then they’ll compile the images into a digital “quilt” that we’ll share online. Fabric and sewing machines will be available so you can make a block for this fun project. Come on out! The first of our 2014 BOM’s, the Almond Country BOM seen on the right, begins next Tuesday April 1st at 6:30pm. Here are some key points about the Block-of-the-month programs at IQ. -You do not have to show up at the mettings, as you can pick up your block any time after the meeting each month. -The first Tuesday of each month is a BOM sit-and-sew day in the IQ classroom. Bring your machine and your BOM and settle in for some sewing time with your fellow BOM participants! -Each BOM program will have a Flickr group where we’ll post photos of that month’s block. You can check out the blocks without being a Flickr member or join the group and post pics of your completed blocks as the year progresses. 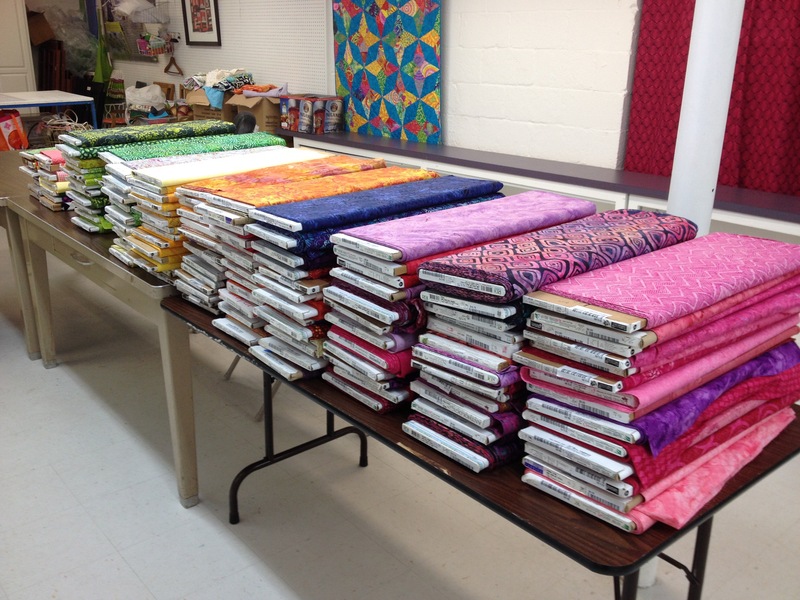 -As always, the cost of each BOM includes all of the fabric for the front of the quilt, the binding, and the pattern or book used with the program. -All of our BOM programs are pre-paid in full, so no worries about how your credit card information is kept secure over the course of the year. -In most cases, you can join any of our BOM programs at any point in the year. We also offer a shipping option for those who live too far away to take part. Contact us via email or phone for shipping details. This year we have three amazing Block-of-the-Month programs (four quilts) from which you can choose. 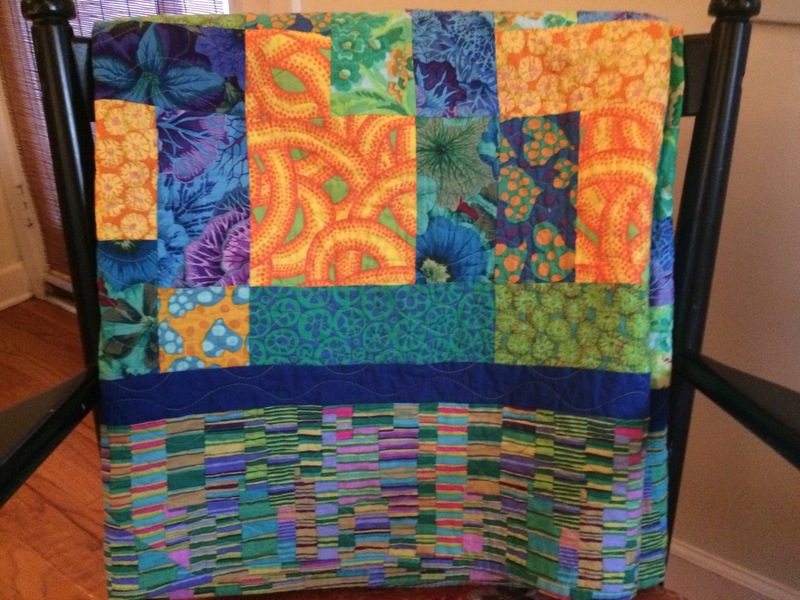 If you’re new to the whole BOM (that’s the shorthand for Block-of-the-Month) thing, a block-of-the-month program leads participants through a quilt one block per month for a year. You’ll get guidance from an expert instructor (or two!) who’s already made the quilt and end up with a fantastic quilt at the end. All of our BOM programs are pre-paid in full, so no worries about how your credit card information is kept secure over the course of the year. 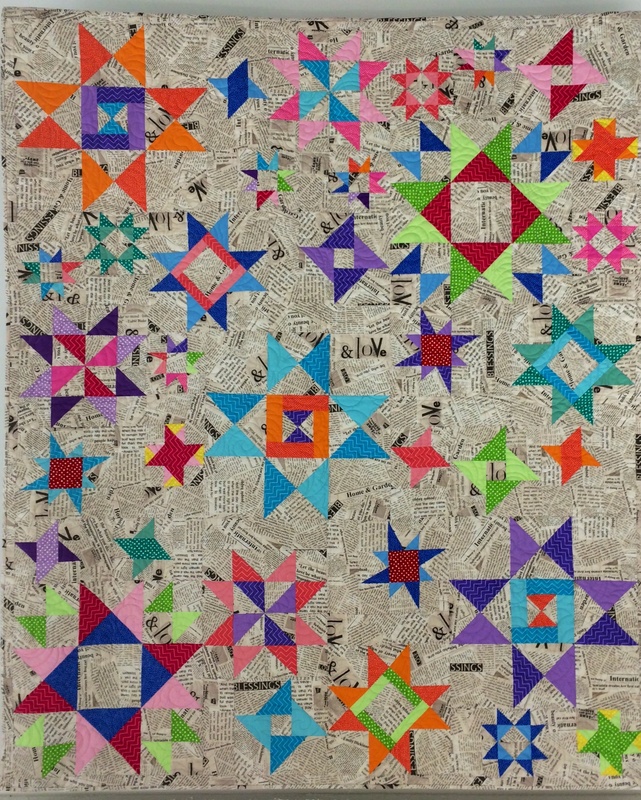 Wanda Earley will be leading this fabulous paper-pieced BOM starting Tuesday, April 1st. This is a scrappy quilt made with Kaffe Fassett collective fabrics and a pale turquoise batik for the background. You can choose an alternate solid batik background. You will tell us your choice of background and we will have it for you in the the first month’s meeting. The price for the BOM will be $225. This price includes the fabric for the top and binding, the pattern, an hour and a half of teacher time every month, and sit and sew time in the shop. BOM meetings will be the 1st Tuesday of each month from 6:30-8pm. You are welcome to come in and sit-n-sew on the first Tuesday after 10am until 8pm. Our modern quilting enthusiasts Sarah Oliver and Allyson Shelton return this year with another stellar modern block-of-the-month program. Their Vintage Revival BOM explores one of the hottest new quilting books, Vintage Quilt Revival: 22 Modern Designs from Classic Blocks. Their softer solid palette is a fresh, new take on the modern-meets-vintage trend and will be sure to leave you feeling like springtime all the time! This modern take on classic blocks starts with 6 months of simple piecing and transitions into paper piecing. Come learn new techniques, or brush up on old skills as we sit and sew to create a fun new quilt! Each Vintage Revival BOM session includes a two-hour sit-and-sew on the second Saturday of the month from 10 a.m.-noon, during which Allyson and Sarah provide their expertise as they explain, cut, and assemble each block, taking the mystery out of each block. All skill levels will be able to make this quilt. There are two quilt options: a 12-block quilt or a 20-block quilt (shown here). One block per month will be taught leaving you with 12 blocks made in class. If you choose 20 blocks, they will be given as homework each month and you will have Sarah and Allyson’s instructions to take with you. 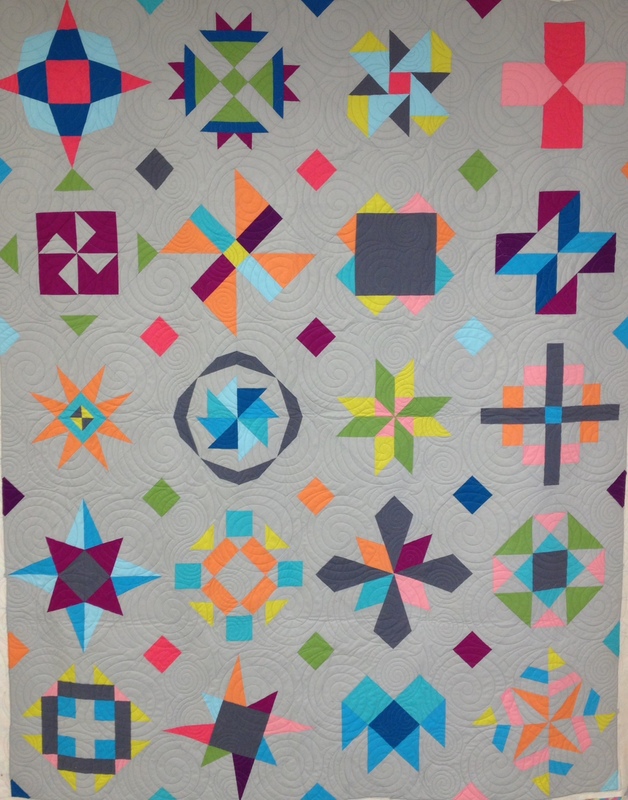 The 20-block BOM quilt is $250 while the 12-block version is $210. This price includes the fabric for the top and binding, the book, two hours of teacher time every month, and sit and sew time in the shop. An Intown Quilters original BOM! We spent weeks trying to find just the perfect block-of-the-month program for 2014. The common thread running through all the quilts we liked? Stars! We fell in love with the Starfall pattern from Fresh Lemon Quilts and contacted designer Faith Jones about using it for this year’s BOM. When she said “yes!,” we immediately dove in to create this year’s Seeing Stars BOM. 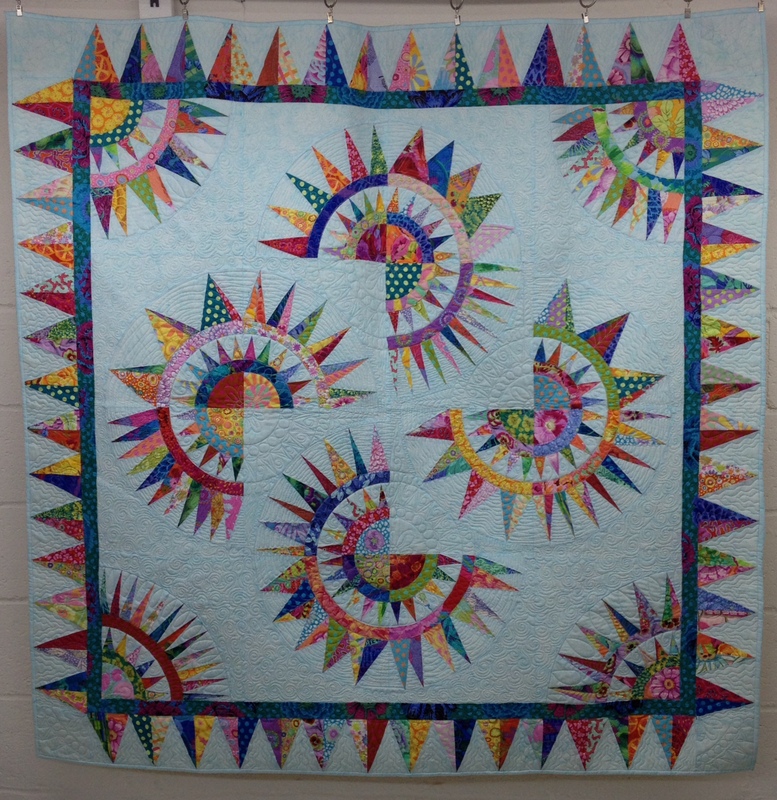 A variety of pieced stars – 10 different styles – in four different sizes make up this wildly fun and eye-catching block-of-the-month quilt. It’s a modern take on a sampler quilt, with a mix of techniques that will expand your quilting skills. At the end, you’ll have a gorgeous quilt to show off! 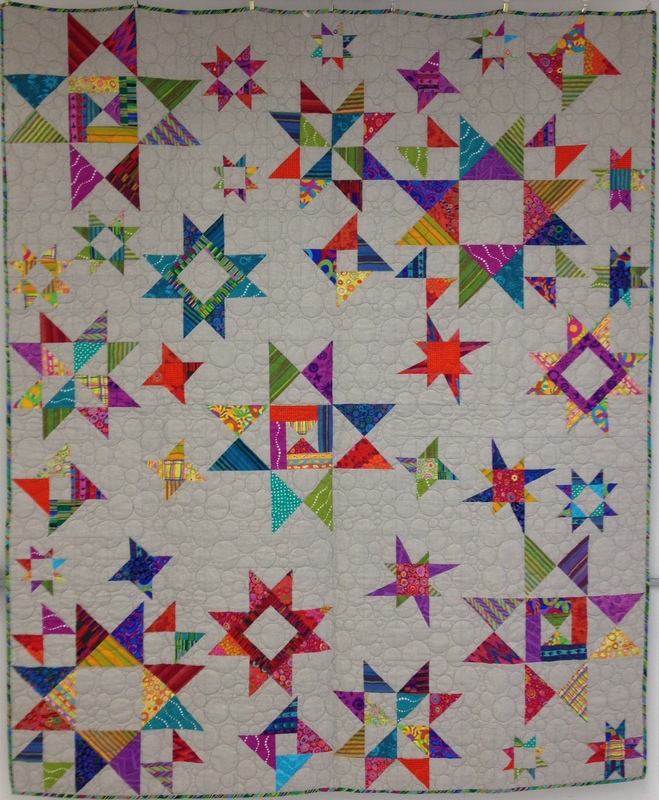 Seeing Stars BOM is led by Sarah Phillips and Mary Abreu and features two colorways. Sarah’s quiltis a scrappy mix of Kaffe prints, shot cotton stripes and blenders on a background of yarn-dyed Essex Linen in Flax. Mary’s Seeing Stars Block of the Month showcases a newsprint background with stars made of a defined palette of zig-zags and polka dots with complementary solids. Her quilt is slightly bigger than Sarah’s with an additional 1.5” frame of the background fabric. 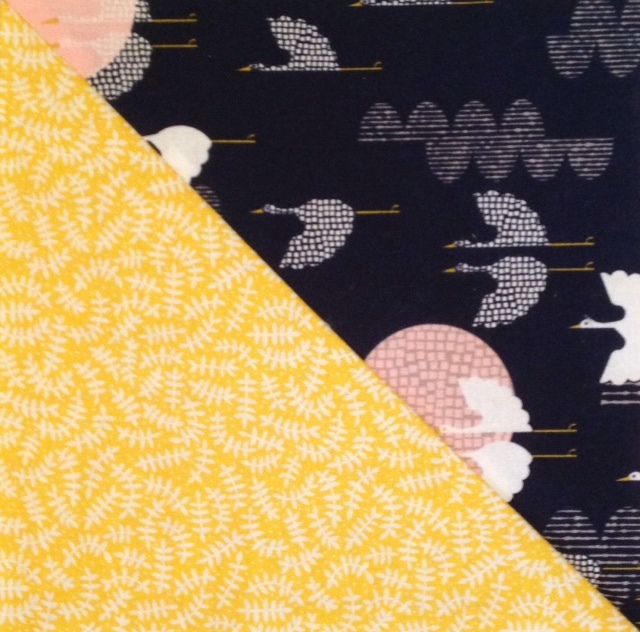 There are limited spots for Mary’s background fabric so get your spot for her newsprint background while you can. Seeing Stars BOM participants can choose either colorway for their quilt. If you would prefer a solid Kona background for either Seeing Stars quilt, please contact Sarah or Mary. This BOM meets on the second Sunday of the month at 2-4 p.m starting April 13th. We will have a short sewing session with the Seeing Stars BOM. Seeing Stars BOM is $250 for either colorway. This price includes the fabric for the top and binding, the Star Fall pattern, patterns for all the remaining blocks, two hours of teacher time every month, and sit and sew time in the shop. Seeing Stars BOM participants are welcome to attend our general BOM sit-and-sew on the 1st Tuesday of the month from 11a-5p. Sarah and/or Mary are usually at the shop on those days until aout 2pm and will be happy to answer questions or offer tips on constructing blocks. This year, we’re adding Flickr groups for each of our BOM programs. We’ll post the latest block additions each month. BOM participants can join the Flickr groups and post their blocks as they progress throughout the year. Because the group is public, you can view the blocks even if you’re not on Flickr. 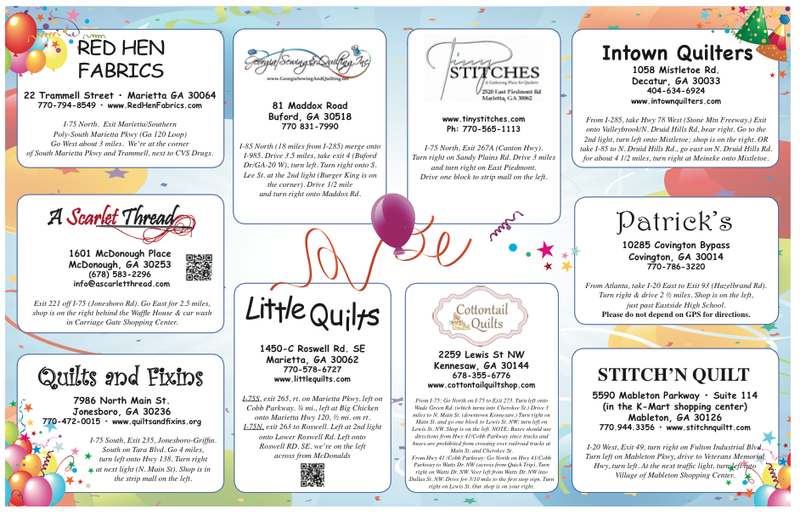 The Greater Atlanta Quilt Shop Hop begins this Saturday! Yay, this Saturday we begin the week-long shop hop of 2014. 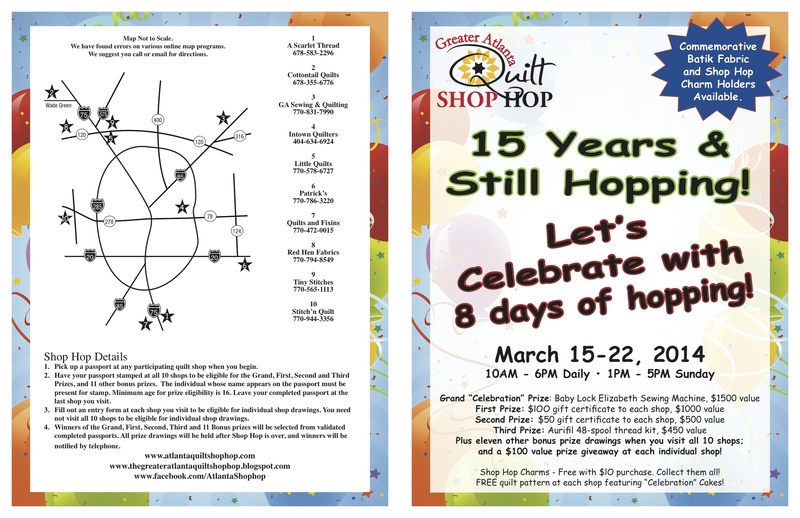 We will all be celebrating the 15th anniversary of a shop hop in Atlanta. Don’t miss out. We have far more prizes than we ever have had before.